Shares in Alibaba have been priced at $68 (£42), the top end of the range, in a sign of strong investor appetite for the Chinese e-commerce giant. With trading starting on the New York Stock Exchange later on Friday, the share sale will raise $21.8bn, making it one of the largest flotations ever. It values Alibaba, which accounts for 80% of all online retail sales in China, at $167.6bn. That value surpasses such corporate titans as Walt Disney and Boeing. The final amount raised from the sale could change, depending on the final allotment allocation. If underwriters exercise an option to sell more shares, the money raised could increase to $25bn, beating the record listing held by Agricultural Bank of China. That flotation in 2010 raised $22bn. Alibaba operates a series of online marketplaces in China and elsewhere, handling more transactions than Amazon and eBay combined. The company was formed 15 years ago by former teacher Jack Ma, who wants to use some of the proceeds to expand in the US and other markets. Trading in Alibaba shares is expected to be frenetic in the early hours after the market opens. Many experts expect the share price to go higher once trading begins as institutions add Alibaba stock to their investment portfolios. US search giant Yahoo, already a shareholder in Alibaba, is selling some $8bn worth of its holding in the offering, leaving it with about 16% of the company. Japan's Softbank is not selling for now and will be left with a 32% stake, making it the largest single shareholder. However, control will remain in the hands of Mr Ma and other company veterans. 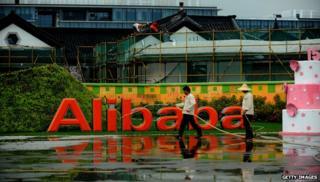 A group of 27 manager dubbed the "Alibaba Partnership" will have the power to nominate a majority of board members. Regulators at the Hong Kong stock market objected to this structure, which resulted in Alibaba deciding to list in New York. Alibaba says the arrangement will help it to preserve its innovative culture. Mr Ma's stake is reportedly worth about $14bn, while the sale is expected to make millionaires out of a large number of the company's managers, software engineers and other staff. Alibaba acts as an online marketplace for wholesalers, retailers, and small businesses, and handles e-payments and financial transactions. The company has also branched out into cloud computing and instant messaging. Alibaba has about 279 million active buyers visiting its sites at least once a month. Online spending by Chinese shoppers is forecast soar over the next few years. And Alibaba has plans to expand into emerging markets as well as Europe and the US. The firm made a profit of almost $2bn in the three months to the end of June, with sales up by 46% year-on-year to $2.54bn. "There are very few companies that are this big, grow this fast, and are this profitable," said Wedbush analyst Gil Luria. Alibaba: What exactly does it do? Can Alibaba's kung fu culture floor its global rivals?